It was great to be at the ‘50 Lives 50 Homes’ Campaign event this morning hosted by Fremantle MLA and Minister for Community Services Simone McGurk at Parliament House. The ‘50 Lives 50 Homes’ Campaign is a targeted campaign to collaboratively address the ongoing challenges of housing and supporting homeless people with complex needs who are sleeping rough. The campaign is using a ‘Housing First’ approach. This approach is based on the concept that a homeless individual’s first and primary need is to obtain stable housing and that other issues that may affect the person can and should be addressed once housing is obtained. Clients are better able to engage with services, address their mental health, drug and alcohol, and any other support needs once they have stable accommodation. Housing First aims to remove the barriers between individuals and access to housing and support. I was speaking with Simone about how we might be able to work together to do something like this in Fremantle. The clear evidence is that it is more effective – and cheaper! – to house someone than try to offer them services living on the street! Monumental Errors: Perhaps, at this Critical Juncture in our History, Fremantle Suggests the Way Forward. War memorials are a feature of the Australian landscape. Obelisk and arch, broken pillar and stone statue remind us of the crippling loss a young nation faced in campaigns overseas. But where are the monuments to conflicts fought in our own country – a brutal war of dispossession that left deep and enduring scars on countless communities? As the recent debate over Australian statues demonstrates, sanitised symbols of violence and dispossession have long stood unchallenged in the heart of our towns and cities. By occupying civic space they serve to legitimise narratives of conquest and dispossession, arguably colonising minds in the same ways white “settlers” seized vast tracts of territory. Stan Grant has called for a Sydney statue of James Cook that claims Cook “discovered” Australia to be corrected. Others have called for the renaming of buildings and public spaces named after Lachlan Macquarie and people associated with Queensland’s slaving(known as “blackbirding”) history. In response, Prime Minister Malcolm Turnbull, along with other politicians and commentator Andrew Bolt, have labelled these calls to alter monuments “Stalinist”. In debating the place “explorers” or “blackbirders” might occupy in civic space, Australians face a choice in how we engage with a past that is painful, multivocal and complex. White Australians raised such memorials as tributes to their colonial pasts; other than as subjects, there was no place for Indigenous peoples. Should politicians, bureaucrats or the apologists for our country’s racist past decide the fate of these memorials today? Or can this debate empower previously displaced voices? These monuments have maligned and marginalised first nations’ peoples from the first day they were erected. And they stand, after all, on land whose sovereignty was never surrendered. Indigenous communities have confronted such challenges before. And they have acted with courage, wisdom and generosity. In Fremantle, Western Australia, a monument that celebrated the racism that mars Australia’s past has today become a symbol of dialogue and reconciliation. The Explorers’ Monument in Fremantle was unveiled in 1913 to commemorate three white explorers – Frederick Panter, James Harding and William Goldwyer – who were killed in the far northwest in 1864. For generations it stood unquestioned in the centre of the Esplanade Reserve in Fremantle, enshrining a pioneer myth writ deep in Australian history. A series of plaques circling the monument claimed that the explorers were attacked at night and “killed in their sleep” by “treacherous natives”. The land where they died is portrayed as hostile and alien: a “terra incognita”. Aboriginal people are described as savages, the whites as “intrepid pioneers”. The orignal plaque on the Explorers’ Monument. Other features of the monument are stridently belligerent. An imposing bust pays tribute to Maitland Brown, “leader of the government search and punitive expedition” who carried the explorers’ remains back with him to Fremantle. Brown’s expedition ended in the massacre of around 20 Aboriginal people; mounted and well armed, none of his party were killed or wounded. In 1994, the United Nations Year of Indigenous Peoples, a counter-memorial was set in the monument’s base. Elders from Bidyadanga (formally La Grange) unveiled a new plaque outlining the history of provocation that led to the explorers’ deaths. It was a striking instance of what scholars call “dialogical memorialisation”, where one view of the past takes issue with another and history is seen, not as some final statement, but a contingent and contested narrative. 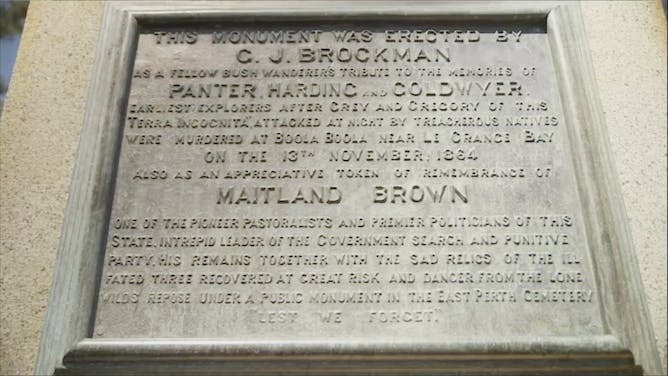 The plaque added to the Explorers’ Monument in 1994. 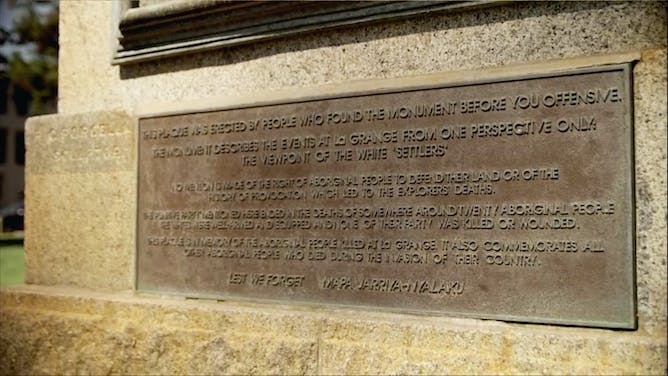 Equally importantly, the plaque acknowledges the right of Indigenous people to defend their traditional lands and solemnly commemorates “all those Aboriginal people who died during the invasion of their country”. The dedication service ended as Aboriginal people scattered dust from the site of the massacre and two white children laid wreaths of flowers decked in Aboriginal colours. The Explorers’ Monument carried the same inscription chiselled on war memorials the length and breadth of our country. “Lest we forget” was the chilling phrase chosen to commemorate Panter, Harding and Goldwyer in 1913, and those words back then were an incitement to racial hatred. Over 80 years later, the people of Bidyadanga and the Baldja network in Fremantle added “lest we forget” to their counter-inscription. This invites us to widen the ambit of remembrance and recognise the common tragedies that attended the so-called settlement of Australia. In the United States, symbols of the nation’s racist past have been the flash points of violent confrontations, such as in Charlottesville. Protesters demand the removal of statues that celebrate slave owners and white supremacists. Right-wing militia groups rally to their defence. Similar debates have emerged elsewhere. Should great centres of learning like Oxford pay tribute to Cecil Rhodes, a man who pioneered the policies of apartheid? Can a democracy enshrine the advocates of racial, sexual or religious discrimination, or peaceful communities honour those who carpet-bombed Europe? In each case, statues and memorials stand at the heart of these controversies. Once the meanings of monuments were thought to be set in stone; now they crumble in the relentless critique of history. Would those opposing the altering of Australia’s colonial statues have also opposed the demolition of the Berlin Wall, or the toppling of statues of Saddam Hassein? In monuments, as in written histories, some narratives are authorised, others denied or disputed. And such critique raises deeper questions, interrogating the very nature of history as a scholarly discipline. Does history cease to exist when a memorial is removed from public view and civic sanction – or is that act of removal, a forceful repudiation of the past, itself an act of choice and agency in history? Ray Minniecon was an Aboriginal student at Murdoch University who led the liaison with Indigenous communities. “Monuments,” he said on the day Fremantle’s counter-memorial was unveiled, “are not just a window into our past; they are a window into ourselves.” We can choose. We may cling to the racism and hatreds of the past or make our own commitment to what the constitutional convention at Uluru aptly dubbed “truth telling”. Perhaps, at this critical juncture in our history, Fremantle suggests the way forward. Right on the back of the news of the return of Falls Festival is great to see Laneway Festival announce it will be back in Fremantle on Sunday the 11th of February. It’s going to be a great summer of festivals in Freo. Reclink Community Cup at Freo Oval this Sunday the 3rd. We were excited about getting the Fremantle Oval back into community hands so we could do great community events again … just like this! The Reclink Community Cup, a much loved Aussie Rules charity match that pits musicians against media is back for its third year in Western Australia on Sunday September 3rd at Fremantle Oval. With teams made up of fearless Perth musicians (the aptly named Bandgropers) and community media and music industry types (The Newshounds), players will puff and pant back and forth across the hallowed turf of Fremantle Oval in a game of partly fun, partly serious hilarity. I am going to dust of my dodgy footy skills so hope to see you there. It is good news that the Western Australian Government is introducing a state-wide container deposit scheme – expected to start on 1 January 2019. Put simply, with a container deposit scheme consumers will be able to get a 10 cent refund on all eligible beverage containers – plastic and glass bottles, paper-board cartons, and steel and aluminium cans between 150 millilitres and three litres. The scheme will reduce litter, increase recycling and protect the environment. It also provides opportunities for charitable and community groups to raise funds. We are particualry keen for this to include local schools. The City of Fremantle ran a trial a few years back with some local primary schools that was a huge success and raised lots of money for them. The Department of Water and Environmental Regulation has released the Western Australian Container Deposit Scheme Discussion Paper for comment until 23 October 2017 and is seeking input on its design. Freo’s Explorer’s Monument shows a way forward on Statue Debate. There is a debate happening around the world on the place of colonial statues; statues often in honour of those who have had a mixed record on treatment of follow humans. Plans to remove statues of Confederate soldiers sparked the deadly Charlottesville riots in the US recently and on the East Australia aboriginal commentator Stan Grant has also raised the issue. In the Sunday Times today Sam Wainwright (speaking as himself not Fremantle Councillor) suggested that some WA colonial statues should be relocated to museums. This is a controversial issue but I actually think Fremantle has already shown a useful way forward on this. In the Fremantle Esplanade is the Maitland Brown Memorial (Explorers Monument) doesn not seek to erase the troubling parts of our history but instead shed new, more accurate light on events – an approach that doesn’t gloss over atrocities but instead shows history from multiple angles. The original 1913 monument has had an extra plaque added to it in 1994 that corrects the biases in the original inscription – showing that history is more than the exploits of heroic explorers, it is also often dark and complex. It is worth checking out. So rather than erase history I think it is important that we add to it and tell more of the full story so we better understand our history. On The 13 November 1864. Repose Under A Public Monument In The East Perth Cemetery. This Plaque Was Erected By People Who Found The Monument Before You Offensive. The Monument Described The Events At La Grange From One Perspective Only; The Viewpoint Of The White `Settlers`. No Mention Is Made Of The Right Of Aboriginal People To Defend Their Land Or Of The History Of Provocation Which Led To The Explorers` Deaths. The `Punitive Party` Mentioned Here Ended In The Deaths Of Somewhere Around Twenty Aboriginal People. The Whites Were Well-Armed And Equipped And None Of Their Party Was Killed Or Wounded. This Plaque Is In Memory Of The Aboriginal People Killed At La Grange. It Also Commemorates All Other Aboriginal People Who Died During The Invasion Of Their Country. Lest We Forget. Mapa Jarriya-Nyalaku. Nice for Freo to be acknowledged as: “… ahead of most of the metropolitan area in promoting and providing for cycling. CYCLISTS want better infrastructure and safer riding routes around Perth and Fremantle, according to the results of a recent survey. More than 44 per cent of respondents to the Bicycling WA (BWA) survey listed infrastructure such as more dedicated bike paths and connected routes as their top priority, while 28 per cent said there needed to be better road safety through driver and rider education and legislative changes. BWA chief executive Jeremey Murray said the need for better infrastructure had been high on the agenda for many years and was currently its number one priority. He said Fremantle continued to be ahead of most of the metropolitan area in promoting and providing for cycling. “Fremantle has long been a leader in promoting bike riding for transport and they have been very proactive providing for bicycles,” he said. “Of course there is always more that can be done. “Access is a real challenge, with the network links into the city via North Fremantle particularly unfriendly towards bikes. City of Fremantle infrastructure and project delivery director Graham Tattersall said they were committed to promoting cycling as a way of encouraging a more active and healthy lifestyle, as well as making Fremantle a more liveable, environmentally-friendly city. He said over the past three years the City had committed more than $2 million towards improvements.